At the time I saw Chimerica last year, I found myself preoccupied with the idea of the photographic image. A play that promised – in its very title, no less – to be about the relationship between China and America struck me as having many more interesting things to say about the nature of the image and the knotty ethics of photojournalism. Not long after, I read both Susan Sontag’s essays on photography and Vivienne Franzmann’s 2012 play The Witness, which also folds its dramatic possibilities outwards from an image taken in the midst of violence. All ask interconnected questions. What is the currency – both economic and political – of images? What does it mean to bear witness? And is to observe to also and inevitably turn away from intervention? Repeating those questions, The Body of an American might now be added to Chimerica and The Witness to form a fascinating trio of twenty-first-century plays with photojournalists at their hearts. Like the other two shows, Dan O’Brien’s tense, muscular play is concerned with the haunting legacy of a famous image – as well as much else besides. Taking as its starting point the long email correspondence between the playwright and his subject, Canadian photojournalist Paul Watson, the play painfully dissects the psychological damage of Watson’s work and the personal demons of both men. While there’s certainly something to be written about the relationship between this, Chimerica and The Witness (and indeed the renewed interest that might have provoked all three plays), The Body of an American alone offers so much to process that it feels necessary to narrow the lens for the time being. So where to start? There is, first of all, an intriguing relationship with authenticity that is persistently pointed to by the Gate’s production. Even before the performance begins, The Body of an American prompts us to engage with questions of veracity. On filing into the claustrophobic, snow-lined bunker that designer Alex Lowde has constructed inside the Gate’s already intimate theatre, our attention is immediately drawn to the two screens bookending the space, both projected with the same statement that everything we are about to see and hear was produced or captured by O’Brien or Watson. At the outset, the show very deliberately announces both its truth and the vantage points from which that truth is to be told. What becomes clear as the piece unfolds is that the play has been constructed from a combination of the two men’s words, drawing on their long email correspondence, their eventual meeting in the Arctic, and other documentary materials. 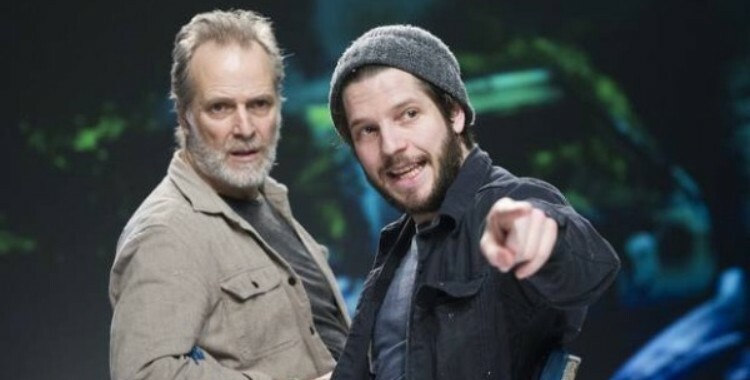 This is all compellingly delivered by just two performers: William Gaminara as “Paul” and Damien Molony as “Dan”, with both also standing in as the large cast of supporting characters (although Gaminara and Molony effectively portray Watson and O’Brien respectively, they are of course distanced representations of real people, so let’s just assume the quotation marks from here on in). The Body of an American is, essentially, a verbatim show. And yet O’Brien has sculpted his own form of documentary theatre from these many fragments. The story he originally wanted to tell was that of Watson, the Pulitzer Prize-winning photojournalist who has documented atrocities across the world. O’Brien was drawn to Watson while attempting to write a play about ghosts; Watson, the haunted man, became his new subject. What The Body of an American has turned into, however, is a play documenting the process of documentary theatre, jumping frenetically between emails, conversations, recordings and reflections. The text is lyrical but dense, its restless movement demanding total concentration from an audience. As well as continually hopping about, the whole thing constantly gestures to its own construction, telling its audience as much about O’Brien’s efforts to write it as it does about the life of the man he has attempted to put on stage. In this way, The Body of an American deftly sidesteps the more problematic elements of verbatim theatre. Despite that initial declaration of authenticity – which I suspect is as much to train the audience’s minds on the idea of authenticity as it is to reassure us of the show’s truth – there is no question of obscuring the process of editing in an effort to pretend to absolute, unmediated truth. The play is, unapologetically, just one version of reality. The same might be said, rather aptly, of a photograph. Photographic images purport to be snapshots of the truth, images of reality, but someone always has to frame them, to isolate that particular moment in time and decide that it is worth capturing. Paul’s words even refer to this. The most important photograph in the play is the one that sealed his success and his torment, both winning him the Pulitzer Prize and haunting him for life. In the moment of taking the infamous image, which shows a US soldier’s battered corpse on a street in Mogadishu, he talks about framing it better, about getting the right shot. Part of what tortures Paul throughout, perhaps, is the disconnect between the truth he endlessly seeks and the artificiality of how he tries to capture it. For all that the show’s content is dark, disturbing and infected with a pervasive sense of melancholy, James Dacre’s production delivers this difficult material with a sharp kick of adrenaline. The pace rattles furiously along, sweeping its audience up in the same addictive thrill that keeps Paul doing what he does. In this way, the production is very good at complicatedly recognising both the compulsive excitement of Paul’s work and the gnawing depression that is, the piece implies, both a symptom and a cause of his chosen career. As the show goes on, it becomes increasingly clear that the same deadening sorrow eats away at Dan; there are moments when a chilling, identical look of desolation pours out of both Gaminara’s and Molony’s eyes. As much as anything, it occurs to me about halfway through, The Body of an American is about relationships between men. The strange yet moving central friendship between Dan and Paul is the most obvious of these, but their respective relationships with the men in their families loom large, as does Paul’s unbreakable link with the ghost of the man he ironically immortalised. It is often the damage of these male relationships that binds Dan and Paul closer together, linked by their common losses and their struggle with normative ideas of masculinity. In their depression, their loneliness and their retreat from society, the two men seem more and more alike; two broken individuals in a broken world. On reflection, it strikes me that the photojournalists in Chimerica and The Witness are also male – perhaps not without reason. All three photojournalists, real and fictional, are observing from a position of white male privilege; their gaze is especially problematic because of the troubling power balance between watcher and watched. In his review, Andrew Haydon brilliantly articulates the significance of choice in the situations depicted by the play, which he argues is a central characteristic of privilege itself. The privileged choose to look on wars and atrocities, to seek them out and capture them for the eyes of people living on the other side of the world. Those caught up in the midst of conflict or disaster simply have nowhere else to look. The tight, intelligent layout of Dacre’s production also makes an audience’s gaze loaded. Those all-important screens at either end of the performance space play host to projections throughout the show, showing harrowing selections from Paul’s back catalogue of warzone horrors. Because of their positioning, these images never directly confront us, meaning that – like Paul – we have to very deliberately look if we want to comprehend the images in question. Though, actually, this isn’t quite true. There is a choice involved in looking at the photographs full-on, in all their horror, but the haunting fact of their presence is unavoidable, flickering away at the peripheries of our vision. Like the tightly packed ideas in the play, they dance around the edges, framing the electrifying action at the centre of the piece. As well as the obvious comparisons to be made with Chimerica and The Witness, Andrew links The Body of an American with Grounded, another Gate show that was equally electric, equally intelligent and equally concerned with America. I’d argue that it also demands to be considered alongside No Place to Go, the third production in a season that the theatre pointedly framed with ideas of work and modern American identity. Despite their differences (and No Place to Go is in most respects very different to the other two productions), what I found myself taking away from all three shows was their deep sense of loss – a loss often stained with bitter disillusionment. Which, taken as a collective statement, seems to say a lot about the USA, our external perspective on it and the modern world more widely. A grim image indeed.